OB Town Council Meetings Are a Gas, Gas, Gas! The Town Council of Ocean Beach has anything but boring meetings. And the one they held the other night – Wednesday, October 28 – was no exception. The main entree, a report and discussion about why OB Elementary School is losing students, was buttressed by lots of other reports, announcements by the Town Council itself, by the numerous politician reps that parade before the meeting, and by ordinary OBceans who attend and give shout-outs or pleas on their favorite project. So, bear with me, dear reader, and accompany me on my journey into the cavern of the Masonic Center, and into my description of the closest thing OB has to a village town hall gathering, clinging closer to the gonzo style than that of the New York Times. Darkness was approaching as stragglers entered the door off the parking lot that caters to the Masons and their guests and into the meeting hall, with dozens of chairs already set up on the linoleum tiled floor, with board members accumulating behind their designated chairs. The downstairs of the Masonic Center is very plain jane compared to the upstairs where the actual Masons meet occasionally, with plush carpets and thick leather chairs. I’ve even been to a community meeting there – once. If you’ve never seen the upstairs, you must. I had thought that since this was the first meeting of the town council after its president, Grethen Newsom, had announced her candidacy for mayor of San Diego, that there would be TV vans and cameras galore. But not a one. It turned out that besides myself, the only reporters in the audience were my colleague Tony de Garate – writing for the Reader, and OBcean Scott Lewis for the Voice of San Diego. Soon as I saw Gretchen surrounded by friends at the Council table, I came up to her and gave her a big hug. I – as many OBceans are – am very proud of our home-town girl going celeb. As I flitted about the room being the social butterfly I am – people were picking their chairs – I noticed it was light crowd tonight. Perhaps the World Series and the Republican presidential debate (really? in OB?) were keeping people home. Over on the sidelines, joined by men in other blues, was blue-suited David Surwilo, community relations officer for the entire freaking Western Division. Have not seen him for a while, he’s been out for surgery and earlier a trip to Alaska. But he’s a great community relations guy. I shook his hand vigorous and told him I missed him. He shook any hint of accolades off and acted like he hasn’t missed a beat. Dave has introduced so many captains and lieutenants to the community these last handful of years, as Western Division has almost a revolving door for upper management, that I once asked him why he doesn’t go for a promotion. Why should I, he shot back. “I get to teach captains,” he said. As was announced this evening, Surwilo is finally getting some back-up and a new sergeant was introduced to the crowd. Newsom was rapping the table with her gavel. Taking my seat, we listened to the announcements from Gretchen. She has decided to be president for another term, she said, to applause. This is the last meeting for the board this year, she said, as the OBTC enters the holiday period. New board members were elected to some offices: Keith Fink was elected treasurer, Jill Chorak recording secretary, and Kameron Coleman corresponding secretary. Nothing like getting the newbies working. I immediately had to get up as the Pledge of Allegiance was beginning. I always omit the phrase “… under god…” and I wish more people would. I carefully listen during that part of the Pledge in hopes one day there will be silence for a couple of moments. One of my favorite parts of the town council meeting – the non-agenda public comment – was the first thing up next. It’s when anyone can get up and for 2 minutes expound on whatever, ask questions, make a point, announce something. And Gretchen – presiding over the at-times contentious gatherings – is very patient. John Ambert, the youthful head of the OB Planning Board, jumped up behind the wood podium that rocked and gave an update on the latest involving the OB Community Plan. It’s going before the San Diego City Council on Monday, November 9th, and John appealed for everyone to get out once more and rally the troops at the Council Chambers to show support. Ambert almost blushed when someone mentioned that he had just received the Community Development award from the council. Ambert works during the day for one of the most prestigious architectural firms in town. Up before the crowd next was Tony Cataldo who announced that he had just been elected president of the Friends of the OB Library. When the clapping died down, he made a plea for “younger blood” on his board and talked about how they raised nearly a $1,000 in their 3 book sales this year. Representing SurfRider was Mica Hamilton, talking about workshops they’ve having soon on drought-tolerant and ‘El Nino ready’ landscaping, and how to capture rainwater. Capturing rainwater is a foreign concept to San Diegans, but we really need to do it, but watch out for those mosquitoes. A woman named Tara (I believe) gave a pitch for volunteers for the yearly all-important count of San Diego’s homeless, called “Point of Time C0unt”. It will be on Jan. 29th from 4 to 7 a.m. The goal is to count the non-sheltered homeless, as part of the federal efforts to give communities funds to challenge homelessness. Gretchen chimed in that she always does it. Finally, closing up the non-agenda (whew! right?) was Gregg of OB CSI (clean streets initiative) who gave out a call for volunteers to help clean up after the OB Holiday Parade. Moving into officer reports, Keith Fink got a chuckle with his treasury report: “There’s money in the bank,” he said. There’s actually over $28,000 in their account. Up next were the reports from the reps of the politicos who represent OB somewhere, somehow. Conrad Wear was first. Wear is probably more popular in OB than his boss, Councilwoman Lori Zapf. There’s rumors that this son of a former city councilman is thinking about running himself. Too premature, Conrad, get some real experience first. But Conrad is always enjoyed by his audiences. His poise, wit and knowledge can carry the day for Lori. Yet, first off in his list of talking points behind the podium were the police cameras (dealt with separately) but he was very enthusiastic about the surveillance cameras the police are installing. “Our office gets lots of calls about crime,” he said. They contacted the police and asked them what they wanted, and they said, ‘cameras’, so his office helped them find $25,000 for the system. “Good stuff for the community,” he exclaimed. Wear also announced that the OB Library’s air conditioning is coming in soon. Just in time for summer. This has been one of his standard announcements now for months. He also noted to some applause that the Orchard street cave had been closed. Also, the issue of short term vacation rentals, he said, is coming to the San Diego Planning Commission on December 3rd. There’s also some street repairs coming down the pike for OB. Gee, that will be different for a change. See, there’s supposed to be a moratorium on any construction at the beaches during the summer months. It gets distracting for the tourists. But now it’s resident time- let’s get on with it. John Ly, Mayor Faulconer’s rep was next. He looked and sounded tired. He used to be Faulconer’s rep when Kevin represented District 2, but it’s clear this is more of a demanding job. He had more details on all the street undergroundings, repairs and pavings. There were too many details to jot down, so, dear reader, for more, I’m sure Faulconer’s office would be happy to extol the infrastructure fixings. I noticed a bit of a rivalry between Ly and Wear on this issue. There were some funny moments while Ly was discussing the availability of sand for sandbags for the coming El Nino rains and floodings. We can’t take sand from the beach yet, he kept saying, but soon we’ll be able to. He denied that the mayor was predicting strong rains before the holidays. Representing Toni Atkins, speaker of the assembly, Rachel Gregg said her boss – a fighter for veterans – will be at that UN climate change conference in Paris, as part of the California delegation. Cali reps were invited because our state is on the cutting edge of something … not sure of what. Roberto Alcantar for Marty Block was, of course, up next – his boss is running against Atkins, or vice-versa. What I jotted down was that Block is fighting the PUC about a possible tariff that will destroy incentives for going solar. He also asked if anyone had any legislative ideas. I took his card. Scott Peter’s rep, Brian Elliot, said his boss is fighting the FAA over these flight path changes. One thing shocking was Elliot’s announcement that San Diego has the 5th largest homeless population in the country, but is only the 29th in terms of receiving federal funds for the homelessness. It’s really good to hear about how all our representatives are out there fighting for us. Toni Atkins is fighting for veterans and against climate change. Block is fighting the PUC and for solar incentives. Peters is fighting the FAA. Community Relations Officer Surwilo was up next. He explained how because of budget cuts over the years, he ended up doing the jobs of 7 others. But now there are additional funds, and Chief Zimmerman, David explained, wants a community relations person in each service area. And the outstanding candidate that joins Surwilo is Officer Penon (spelling?). Surwilo introduced Police Lt. Carter, who stated that San Diego Police is the leader of the world in body-worn police cameras, in the amount and numbers of cameras and in department policies and procedures. Now, after they understand the cameras, Surwilo added, all San Diego officers support the body-cameras. (Surwilo and Carter both then discussed the surveillance cameras – which again will be a separate post.) Lt. Carter did say that they expect the 10 surveillance cameras to be installed along the OB waterfront from the pier to the river by the end of November. Last up from the first responders was a lifeguard sergeant, who very quickly gave us some rescue numbers for the month of September: 170+ – and October 10th had 75 rescues in one day. 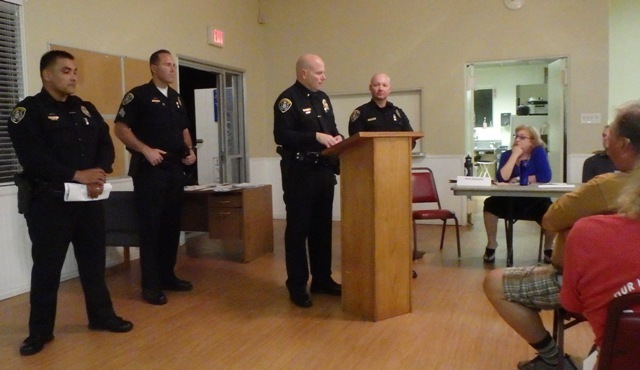 There’s much more from the OB Town Council meeting of Oct 28, 2015, and it will be covered in a subsequent post. That was so great Frank..thanks for all the updates for those who could not be there. I’m working on Round 2 right now, to be posted Saturday. Thank you Frank. And President Gretchen– so poised and such a great leader– did not even mention her candidacy. Strictly Ocean Beach business, and lots of it. Newer Article: OB Town Council, Round Two – Where Have All the Students Gone?